Taking on the day-to-day in our own way. The strawberries at our local farmers’ market are looking great and tasting sweet. You may remember that we whipped up a pretty (and delicious) all-natural strawberry simple syrup recently and I’ve enjoyed mixing it into fizzy drinks like soda water and champagne. But my favorite use (so far) has been using it as a way to jazz up a classic gin and tonic, my usual drink of choice. The strawberry syrup adds a subtle fruity flavor and transforms the cocktail into a festive-looking pink sipper. I think I may have to go have another! 1. Fill a glass with ice. 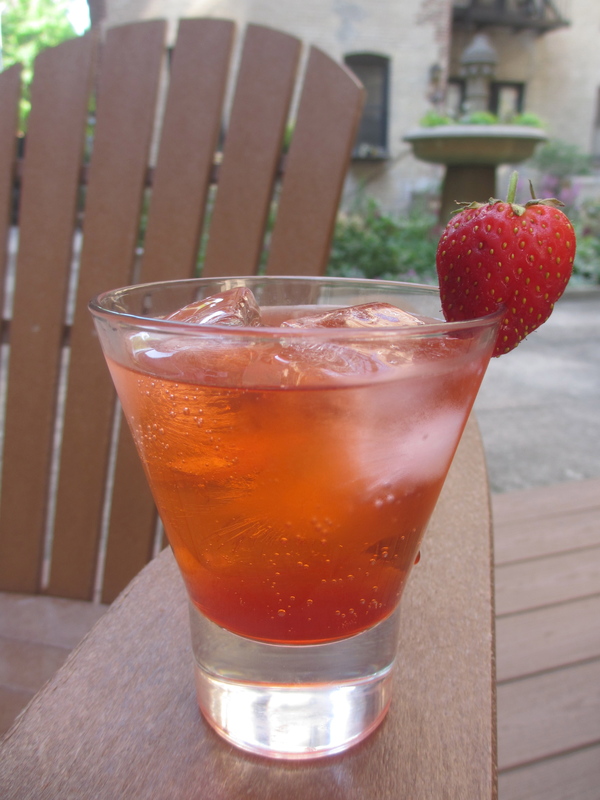 Pour in the gin and strawberry simple syrup, then top with tonic water. Gently stir until combined. Taste and adjust flavors if necessary. Garnish glass with the strawberry. SWWU Tip: Make your ice cubes out of tonic water for an extra special treat. Like what you see? Follow us on twitter @SWWUblog and like us on Facebook for bonus photos and content.